Today in Greece a great 48 hours strike begins to protest against the austerity plan implemented by Papandreou government. 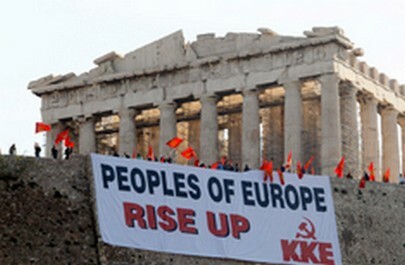 Concurrently, here is a fact which I think is particularly symbolic: the communist trade union Pame, the All-Workers Militant Front - close to the Communist Party of Greece - has occupied the Acropolis and some protesters hoisted a banner which says: "Peoples of Europe rise up." Oh, how I love this phrase. Do you know why? You could say that’s because of the rise up, because this verb stimulates my perennially boiling rebel mind. You are Italy, Greece, Germany, France and all the other countries. They are just those who have patented the name. They are just those who understood how to use it first. They are just who will run away first when the ship will sink. Because you are the every day walking, working and fighting Europe. You are the engine, not that under the hood. They are traveling, not you. They decide the speed, not you. They arrive at the finish, never you. Because you are the ones who have to talk each other, face to face, everywhere. You should be intercepted; you should be those who say the words able to bring down the house of trick cards they have built around you. They have never had anything interesting to say. They never needed to tell you the truth. They are just a good bluff. Peoples of Europe, at least for now, turn off also this computer and rise up. Because those streets and squares are yours. You are the ones that have built them. You are the ones that daily pay their price. The News: "We pay for sins of others." Rise up people! All over the world! Do not let them to steal your life! Do not let them steal the life of your children! Love the banner. Rise up and start working you lazy greeks! "Love the banner. Rise up and start working you lazy greeks!" I have my own job In Greece,crete and i have to work 15 hours a day 7 days a week for 90 euros everyday!Do you like it?Don't forget that afer i have to pay my bills electricity rent of the shop e.t.c. I think politicians are looking and they are lazy and they playing bad games for us,so we looking bad to europe,but we are the same! No, Greeks do not retire at 53 (it was at 55 for the really heavy proffessions, the unhealthy ones etc.). Ah, if you refer to the army, yes, you can retire at 45-50 or higher (if you want to have a great career...). If you are a worker and you retire earlier, you only get a part of the pension, so very few do so. A question for you; due to the technological progress, don't you think that people could and should retire earlier, in order to enjoy their old age? What happened today in Athens (3 people killed) is a pure provocation. It was the greatest demonstration for the last 20-25 years. Government diecided to terrify people with that trick. It has happened in the past, it happens again. It is the "socialist" government which is behind that, no matter what you will hear from the mass media. Solidaity to Croatia and all the Balkan Peoples. Rise Up! PEOPLES FROM EUROPE AND ALL OVER THE WORLD, JUST RISE UP! THE PLACE IS HERE, THE TIME IS NOW! Yes, Rise Up Peoples of Europe AND the world! Say NO to the greedy international corporations that are enslaving people to unnecessary technology. The great roller-coaster has got to stop! The only ones who really want it are the fat cats who are selling all the rubbish and getting richer and richer!